There is a British rock star living inside Masayuki Nakano and Michiyuki Kawashima of Boom Boom Satellites. The Japanese duo — who are superstars in their home country — let this alter ego take full effect on their best-of album Over And Over. 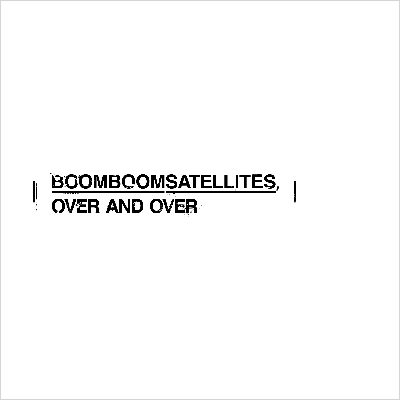 Boom Boom Satellites combine crunching electronics with melodic rock riffs to put a spin on the traditional four-piece ensemble with their powerhouse of two. Most of the material on Over And Over has not previously been released stateside, including explosive album opener, “Kick It Out” from the full-length, ON. Oasis is channeled on “Let It All Come Down” where vocalist Kawashima lets forth the full strength of Liam Gallagher’s nasal twang in his delivery. On “Moment I Count”, The Prodigy is emulated without apology, complete with snarling lyrics and static-laden sound-clashes. Alternatively, “On The Painted Desert” is a moody orchestral piece that draws heavily on the psychedelic aspects of Primal Scream’s Screamadelica. Much of what is heard on Over And Over has found its way onto an anime screen — and that is the most appropriate space for these manga characters come to life. Buy this at iTunes. After the jump, check out the video for “Kick It Out”.